The architecture of the Gold Coast neighborhood is dominated by three primary styles: the Queen Anne, the Richardsonian Romanesque and the Georgian revival style. The Queen Anne style can be spotted from the use of gables, transepts, angles, recesses, balconies and towers. One of the most typical examples of this style is the Cardinal's residence at 1555 North State Parkway with its picturesque roofline of many chimneys, turrets, dormers and gables designed by Alfred F. Pashley in 1880. Round-arches and lintels in rock-faced masonry, often emphasized with contrasting stone, easily identify the second style, the Richardsonian Romanesque. Round or polygonal turrets and projecting bays crowned by conical roofs are other characteristics of this style. 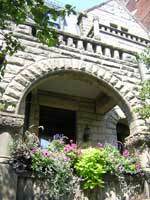 Eastern architect Henry Hobson Richardson created this Romanesque style of building. One of the best remaining examples of Richardson's personal work is the Glessner House built in 1886 on Prairie Avenue. Unfortunately another of his design, the MacVeagh House built in 1885 on Lake Shore Drive, has been demolished. However, his style influenced many architects who built homes in the Gold Coast. One such architect, Charles W. Palmer, used the Richardsonian Romanesque style for the town houses at 1316-1326 North Astor Street in 1889. The style is reflected in the round and full arches, the turret windows, and the massive stone texture. These picturesque styles were replaced by a new style of symmetry and formal order brought to Chicago as a result of the World's Columbian Exposition. It was made popular by the East Coast firm McKim, Mead and White. This style for residential building was the Georgian revival, influenced by Georgian England and its American adaptation. The Georgian revival style is strictly rectangular in plan and has symmetrical facades. The roofline is usually marked by a classical cornice, railing, or balustrade. The Patterson-McCormick Mansion at 1500 North Astor is an early example of the Georgian revival style. Stanford White designed the house in 1892, and the style is marked by its symmetrical and box-like structure. The Patterson-McCormick Mansion at 1500 North Astor is an early example of the Georgian revival style. Stanford White designed the house in 1892, and the style is marked by its symmetrical and box-like structure. These architectural styles continue to define the unique character of the Gold Coast and connect it to its illustrious past. A walk through the neighborhood will reveal the beauty in the styles and magnificence that is being preserved today. Public tours of the Charnley-Persky House are available on a regular basis on Wednesdays and Saturdays, with appointments available during the week for groups of ten or more. Photography is allowed. The tour entrance is through the garden door at the south end of the building. Reservations are required only for groups of ten or more and should be made well ahead of time. The house is closed from December 24 through January 1 each year. Wednesday Tours: include the exterior and interior of the Charnley-Persky House. Saturday Tours: Tours include the exteriors and interiors of both the Charnley-Persky and Madlener houses, as well as an exterior tour of the 1400 block of North Astor Street. Times: April through November - 10:00am & 1:00pm; December through March - 10:00am only. Cost: $15 adults; $12 seniors and students age 18 and under; $8 youths age 5-12. All teachers with a valid State of Illinois ID are admitted free of charge. For prerecorded tour information call (312) 915-0105, and for additional information on tours and area architecture, please contact The Society of Architectural Historians (www.sah.org) housed at the Charnley-Persky House. Lake Front Neighborhoods Tour: Cycle past major sights north of the Chicago River - including the Magnificent Mile and Oak Street, historical sites in the Gold Coast and Old Town, and a Lincoln Park Zoo and lakefront stint with our impressive skyline view. An additional resource in our neighborhood is the Graham Foundation for the Advanced Studies in the Fine Arts, www.grahamfoundation.org. The mission of the Graham Foundation is to nurture and enrich an informed and creative public dialogue concerning architecture and the built environment. The Foundation is located at 4 West Burton Place in the Madlener House. The work of architect Richard Schmidt and designer Hugh Garden, the House was built in 1901-02 for Albert Fridolin Madlener and his wife Elsa, both of whom came from prominent pioneer Chicago Families.